Home blog What do the French Eat at Christmas? The whole world instinctively understands that French cuisine is synonymous with delicious and elegant food. At holiday time, all the stops are pulled and holiday food rises to a new level. Usually, Christmas Eve is a more important time for gathering and eating than Christmas Day itself. This is called the réveillon de Noël. The Réveillon (without Noël) usually refers to New Year’s Eve. People send holiday cards to wish friends and family a Happy New Year, not to wish a Merry Christmas. 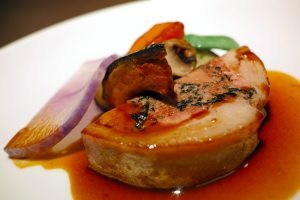 Foie gras There are many varieties and quality levels of duck and goose liver paté. It is a specialty served on toast or baguettes as an appetizer during a Christmas or holiday meal. It can also sometimes be served with spice bread and fig jelly. Bûche de Noël Ever heard of a Yule Log? 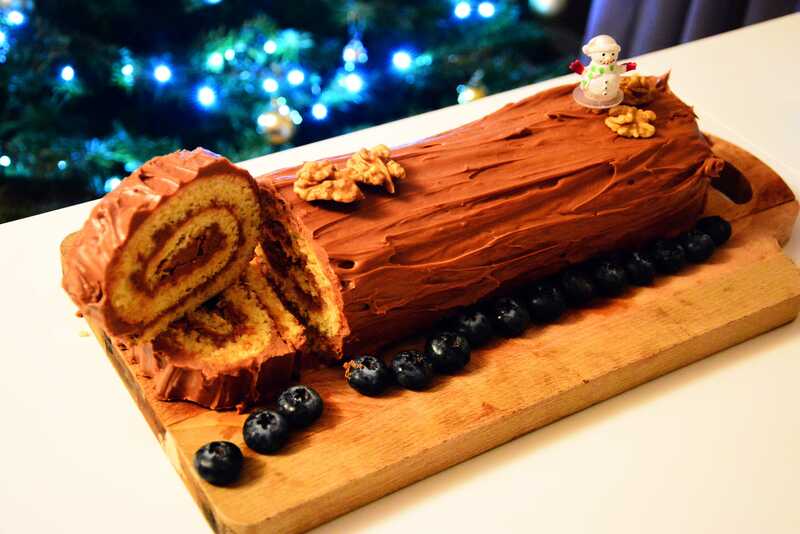 That’s what a Bûche de Noël is, but comes in many varieties, and has been a holiday tradition since the 19th century. The standard is chocolate, but you won’t be surprised to find them with orange, raspberry, chestnut, praline, or any combination of those. Oysters Though oysters can be eaten all year, most oysters are eaten at the Christmas holiday season. Specialties such as caviar and escargot served as apéritif or appetizer. Stuffed goose or turkey or roasted leg of lamb. Often the stuffing is not what you’d expect. It may combine liver, bread, and a dried fruit such as prunes or apricots. Capon This is a special rooster, and the most famous are from the region of Bresse. Chocolate and Truffles You may think truffles are an odd-looking type of mushroom. 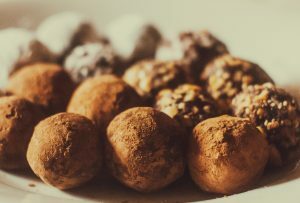 They are, but another treat called a truffle is made of chocolate and especially enjoyed around Christmas (Recipe below.) Go into any French grocery store right before the holidays and you’ll see boxes of chocolates and truffles to enjoy, to offer, and to tuck away for later. Gradually add butter in bits, egg yolks, and cream. Mix well. Add the powdered sugar while stirring. Put this mixture in the fridge for 2 hours. When the mixture is firm, form it into small balls the size of a walnut. Roll these in the cocoa and return them to the fridge until ready to serve. Makes around 20 truffles. For more holiday spirit, see the post, Christmas in Paris. It is traditional to display the nativity until February 2, which marks the crêpe holiday, the Chandeleur. According to the legend, if you flip a crêpe and it comes down correctly, you’ll have good luck all year. Another version says if you can flip a crêpe while holding a coin, you’ll have prosperity all year! Joyeuses Fêtes (Happy Holidays) et Bon Appetit! Buche de Noel, Christmas, Christmas Eve, Christmas food, foie gras, France, holidays in France, New Years Eve, Paris, truffles. Bookmark.